Divide players into two teams to encourage friendly competition with these Adult Scrimmage Vests. It's easy to tell who's who on the playing field when players are wearing these vests, which come in two different colors to distinguish members of each team. 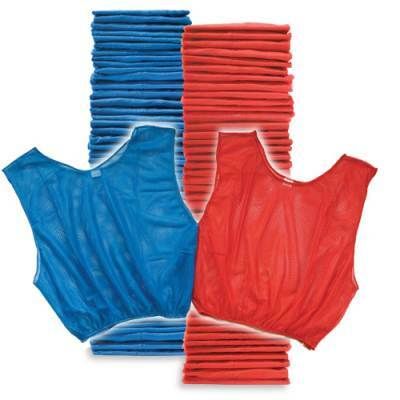 The vests won't ride up or shift as players run after the ball thanks to the elastic waistband that ensures a secure fit and limits adjustments. Keeping athletes cool and comfortable on hot days or in stuffy gyms, the polyester mesh construction stays breathable and maintains a cooling airflow as the game starts to heat up. Pick the Color Combinations and Quantities to Fill Your Needs!